Few years ago, 'Srimad Andavan' visited Coimbatore. With the grace and blessings of our 'Acharyan' we got the opportunity for offering one day 'Thatheeyaradhanai' (prasadam/lunch) to all the devotees. It was on this day, I tasted this karamudhu (curry) for the first time. It tasted very good. I never thought we can make a dry curry with ashgourd until I had this in 'Andavan Ashramam'. 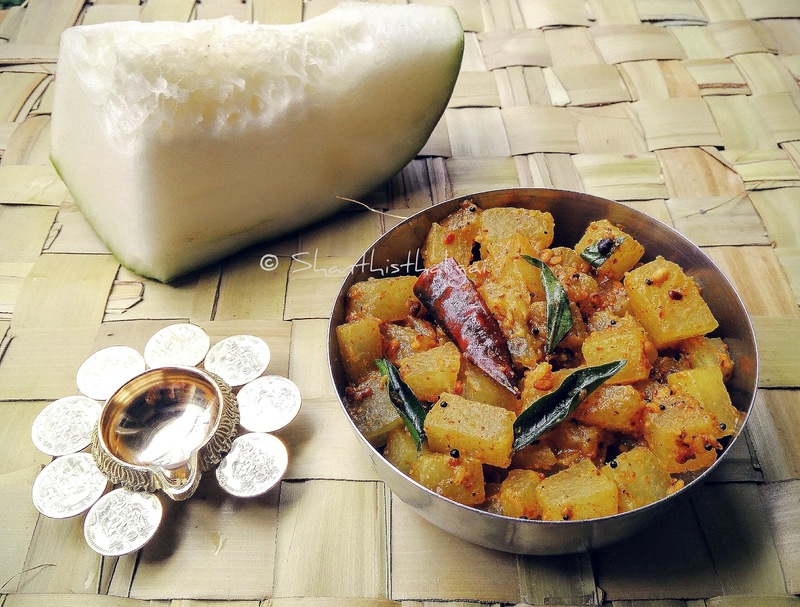 Usually, I make only koottu and sambar with ashgourd (vellai pooshani). After trying this at home, I became a great fan of this karamudhu. These type of curries are called 'samaan podi karamudhu' or 'podi idicha karamudhu' in 'iyengar thaligai'. If you are bored of pooshanikkai koottu and sambhar, do try this simple curry. Ash gourd (vellai pooshanikkai) - 1/2 kg. Methi seeds - ¼ tsp. Cut ashgourd into cubes. Discard the skin and seeds. Heat a spoon of oil in a pan and dry roast the ingredients given in 'Dry roast and powder', until golden brown, powder coarsely and keep aside. Heat oil in a heavy bottomed pan, add mustard seeds, urad dhal and red chillies. When golden brown, add hing, turmeric powder, curry leaves and cubed ashgourd.. Add salt, saute well and cover with a lid. Cook until done. It should be crunchy, not mushy. When done, add the 'Mel podi'. Mix well. Saute for 2 more minutes. Mutt style pooshanikkai karamudhu is ready. First time coming to know about this.vellai poosani has high water content and making a dry version is difficult. Should try this. The term "Podi thooval" is used in our family. I tried this very successfully. How do I post a photo? You cannot post a photo here. However, you can in FB and tag me.